If you care about your game always make sure that your table is equipped with original italian slate, because the difference is in the slate. Insist on italian slate in your table. It is a lifetime investment! Nothing can compare with original italian slate for strenght, elasticity, precision and playability. Ask your dealer about the original italian slate which guarantees that you are getting the best product for your money! Sell More With Original Italian Slate! Best Playing Surface - Italian slate enables dealers to sell more tables because it provides the best playing surface in the world. For many years Italian Slate has been the optimum testing surface for all the linked products and accessories. Better By Composition - Italian slate is easier to handle and fit into your tables because of the inherent elasticity of the slate. Cost Effective - Original Italian Slate is the world's finest yet it costs no more than any other alternative slates. It is a long time investment with a low quality/cost ratio. Environmentally Safe & Friendly - Buying a pool table with Italian Slate is environmentally safe and friendly to nature. Professionals Only Play On Original Italian Slate - Italian slate is the only playing surface that is used by professionals in major billiard tournaments around the world because it is simply the best playing surface on the market. Educate The Customer - Educate your customers to rely on the OIS (Original Italian Slate) emblem for quality and you will sell more. Sales Materials - Please feel free to contact the Italian Trade Commission for a supporting materials to increase your billiard sales such as: brochures, videos ("ITALIAN SLATE THE OPTIMUM PLAYING SURFACE" and "SELL MORE WITH ITALIAN SLATE"), information on customer distribution and OIS initiatives. Insist on Original Italian Slate for the best playing surface - The most important part of buying a pool table is the playing surface. 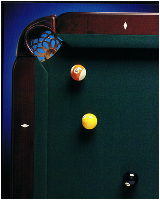 Buying a pool table with Original Italian Slate ensures you will be playing on the best possible surface on Earth! The brand of the actual table is an important concern but should be secondary to the playing surface. The Truest Roll! - Original Italian slate is perfectly level. Please click here for the scientific facts why slate from the Ligurian region of Italy is the best playing surface in the world. Environmentally Safe & Friendly - Buying a pool table with Original Italian Slate is environmentally safe and friendly to nature. Original Italian Slate comes in all sizes for your billiard needs: Coin-Op Tables - One Piece Slate - Pool Tables - Three Piece Slate - Snooker Tables - Three And Five Piece Slate. Original Italian Slate recommended by: Professional, billiard store owners and thousands of happy customers worldwide. Play Like A Champion - Click here for a schedule of professional billiard tournaments played on Original Italian Slate. Request the OIS Logo - Ask for the OIS (Original Italian Slate) stickers on your playing surface when you walk into your local billiard table store. To make sure that you are going to buy a table equipped with Original Itali an Slate please look for the OIS stickers which are on the lower face of each section. Profile of the Original Italian Slate Companies. Environmental Benefits - Underground QuarriesItalian slate companies extract the slate from environmentally safe underground quarries. There are several important benefits of underground quarries such as: less pollutants, low noise levels, underground blasting, forestry preservation, re-cycling and purification of water and preservation/restoration of the land in use. Favorable Labor Conditions - Italian labor policies ensure the proper protection for laborers such as: organized labor laws, skilled and approved workforce and minimum age requirements. Automated Equipment - Besides improving the accuracy and speed of manufacturing, automated lifting and factory equipment eliminates the need to employ unfair labor practices. Scientific Facts About Italian Slate - The commercial definition of slate is rocks which are easily split into thin sheets along a plane of cleavage resulting from a schistosity flux, caused by very low or low grade metamorphism due to tectonic compression. They are distinguished from sedimentary (stone) slates which invariably split along a bedding or sedimentation plane. Original Italian Slate absorbs a very low amount of water - therefore it does not cause damp cloth. It has a very low content of Si02 (quartz) which makes it: soft, easy to work with, elastic for easy installation and flexible for high resistance to rupture. Ligurian Region is geologically unique - The high moisture content in the slate is unique to the region. The slate industry hosts one of the most knowledgeable and experienced work forces in Italy. Slate - Italian Slate also plays an important role in the building industry, as it is successfully used for several applications, namely: flooring, fireplaces surroundings, internal cladding and walling, staircases, tabletops, kitchen counters tops, tiles for roofing purposes, etc. Available in different kinds of finishings according to the specific usages. Random size slabs are also available in different thickness and various finishings for marble and/or other stones workshops.